Click on the map to see a larger version. Full-size black and white maps will be included in your registration packet. Click on the profile to see a larger version. 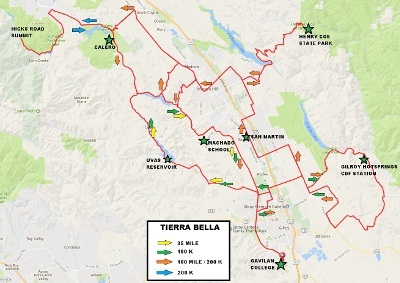 If you have not ridden much over the winter, we recommend this flat route through Gilroy and a big loop out past Uvas and Chesbro Reservoirs. This route makes a good family ride. With the 100K, you do much of your climbing in the morning as you start with a climb to Gilroy Hot Springs. After a descent down Canada Road, you will pass back north of Gilroy before looping around Uvas and Chesbro Reservoirs. Then a quick return to Gavilan College. With the 100M, you also begin your ride with a climb up to Gilroy Hot Springs, but that is just the beginning. After descending down Canada Road, you will head north to do the challenging climb up Dunne Ave to the summit at Henry Coe State Park Headquarters. Then you descend back down the same roads and head northwest to Bailey and up to Calero County Park. 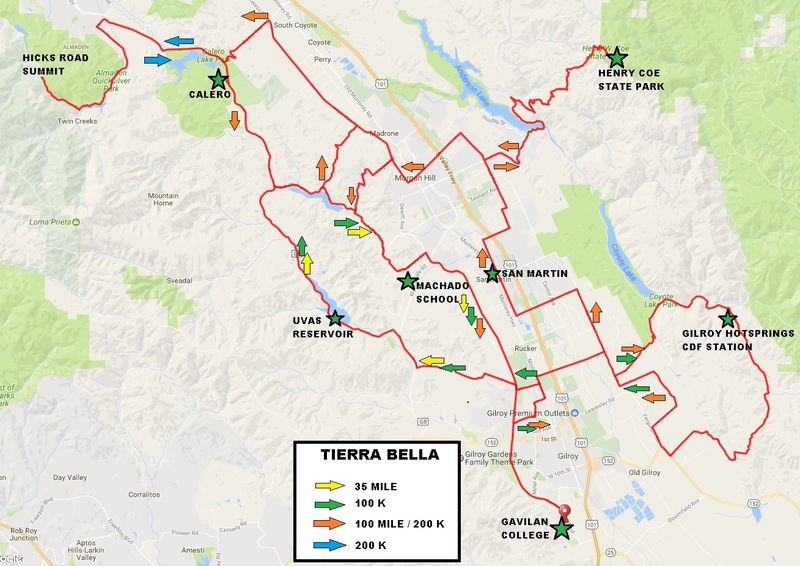 By this time the northern winds should have picked up to push you south past Chesbro Reservoir and on to Gavilan College. 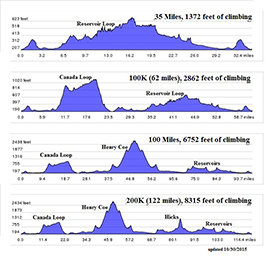 If the 100M is just not enough for you, then you can add on a scenic ride out to New Almaden and a climb up to the summit of Hicks Road before retracing your route back to Calero County Park to rejoin the 100M. 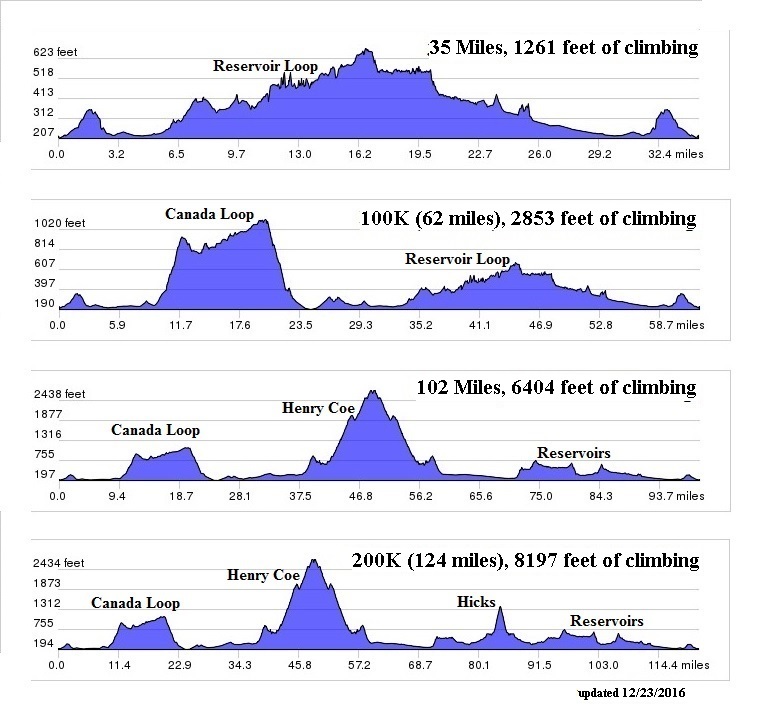 Revised 12/23/2016 to use “Ride With GPS” mileage and climbing totals. We will provide RideWithGPS downloadable routes to registered riders as the date approaches. These routes may be used off-line with the RideWithGPS smartphone apps and other GPS units. All rides start at Gavilan College, on Santa Teresa Blvd. just south of Gilroy, about 35 miles south of San Jose. If you are heading south on Highway 101 from Gilroy, turn right on Castro Valley Rd. and right on Santa Teresa Blvd. to the north entrance of Gavilan College. Look for a sign to Gavilan on Hwy. 101 just south of the Monterey Rd.exit. If you are approaching Gilroy from the south, you will not be able to turn left from northbound 101 onto Castro Valley Rd. due to the median barrier. Continue north to the Monterey Rd. exit where you can loop under 101 and head back south to Castro Valley Rd. There is no need to physically check in. If you have NOT received a registration packet in the mail, please come to the Help Desk in the Student Union/Cafeteria and we will assist you. The course closes at 5:00 PM. Riders must start and finish during this interval. Rest stop cut-off times listed on the route sheet will be strictly observed. We have support from volunteer mechanics and local bicycle shops (details subject to change). Parking at Gavilan College is limited and free. The college will enforce all parking restrictions and may issue citations. Please rely on our friendly, helpful parking staff (in orange safety vests) to direct you. There is no overnight parking or camping at Gavilan College. The Gavilan gates will open at 6:30 AM. Due to Gavilan regulations, camping vehicles, cars with trailers, or any vehicle not able to fit in a regular parking space will be directed to off-road parking near, but not on the Gavilan campus. For a list of local motels and campgrounds, please see FAQs for links to lodging facilities. When you return from the ride, lunch will be served at Gavilan College.